The American philosopher and statesman Thomas Jefferson was the first secretary of state, the second vice president, and the third president of the United States. As president, Jefferson successfully negotiated, or bargained for the terms of, the Louisiana Purchase, which nearly doubled the country's size. A man of broad interests and activity, Jefferson remains an inspiration, for both his political accomplishments and his vision for America. Thomas Jefferson was born in Shadwell, Virginia, on April 13, 1743. His father had been among the earliest settlers in this wilderness country, and his position of leadership transferred to his oldest son, along with five thousand acres of land. Jefferson became one of the best-educated Americans of his time. At the age of seventeen he entered the College of William and Mary, where he got exciting first glimpses of "the expansion of science, and of the system of things in which we are placed." He read widely in the law, in the sciences, and in both ancient and modern history, philosophy, and literature. Jefferson was admitted to the bar, or an association for lawyers, in 1767 and established a successful practice. When the American Revolution (1795–83) forced him to abandon his practice in 1774, he turned these legal skills to the rebel cause. Jefferson's public career began in 1769, when he served as a representative in the Virginia House of Burgesses, the nation's first elected body of government. About this time, he began building Monticello. Perched on a wooded summit, the lovely home would become a lifelong occupation. Monticello, like the many other buildings Jefferson designed over the years, was an original, personal creation. Jefferson rose to fame as an effective spokesman during the American Revolution, and his political thought would become the centerpiece of liberalism, or a movement to develop freedoms, in America. In challenging the British Empire, Americans like Jefferson came to recognize their claims to an independent nation. Jefferson's most important contribution to the revolutionary debate was "A Summary View of the Rights of British America" (1774). He argued that Americans possessed the same natural rights to govern themselves as their ancestors had exercised when they moved to England from Germany. Writings like Jefferson's, began to stir support for a revolution. Soon there would be no way of avoiding war with Great Britain. The Revolutionary War (1775–83) had begun by the time Jefferson took his seat in the Second Continental Congress in Philadelphia in June 1775. The Congress brought together many of America's prominent political figures of the time. It was chiefly as a legislative draftsman, or legal writer, that Jefferson would make his mark, with his great work being the Declaration of Independence. Signed by most parties on July 4, 1776, the Declaration of Independence formally announced that the American colonies were separating from Great Britain. In June 1776 Jefferson was surprised to find himself at the head of the committee to prepare this paper. He submitted a draft to John Adams (1735–1826) and Benjamin Franklin (1706–1790), who suggested only minor changes. Although many changes were made in the end, the declaration that emerged on July 4 bore the unmistakable stamp of Thomas Jefferson. The Declaration of Independence clearly set forth the problems with British rule and expressed a political philosophy and a national faith in only one paragraph. Here, for the first time in history, ideas were laid as the foundation of a nation. Natural equality, the inalienable (or not able to be taken away) rights of man, the freedom of the people, the right of revolution—these ideas gave the American Revolution high purpose. Jefferson became Virginia's governor in June 1779 as the Revolutionary War had entered a new phase. The British decision to attack in the South would, if successful, have made Virginia the critical battleground. Jefferson struggled against huge odds to aid the southern army in defending its territory from the invading British. soldiers into Virginia, and the government moved to the safer city of Charlottesville, Virginia. The Redcoats, or British soldiers, followed, and Jefferson was chased from Monticello. Wounded by the criticism of his retreat, Jefferson decided to quit public service. A series of personal setbacks, including his wife's death in September 1782, plunged him into gloom. It appeared the life he had sought in his family, farms, and books was suddenly out of reach. That November he eagerly accepted congressional appointment to the peace commission in Paris. He never sailed, however, and wound up in Congress instead. In Congress, from November 1783 to the following May, Jefferson laid the foundations of national policy in several areas. He drafted the first regulation of government for the western territory, where free and equal states would be created out of the wilderness. Jefferson also took a leading part in creating foreign policy. The American economy rested on foreign commerce, but only France was open to trade with America. In 1784 he was appointed to a three-man commission (with Adams and Franklin) to negotiate treaties of commerce with the other European powers. He then replaced Franklin as the representative to France and spent the next five years in Europe. On Jefferson's return to America in 1789, President George Washington (1732–1799) appointed him secretary of state. For the next three years he was chiefly engaged in fruitless negotiations with the European powers. With Spain he sought to secure free navigation of the Mississippi River through Spanish territory to the Gulf of Mexico. With Britain he sought the removal of English troops from the Northwest and settlement of issues left over from the peace treaty. By 1793, relations between the Federalist and Republican parties worsened. When war erupted between France and Britain in 1793, the opposing views of the parties toward these nations threatened American peace. Jefferson attempted to use American neutrality. As a neutral country, the nation would support neither side during the war. By doing this he hoped to force cooperation from Britain and to improve relations between the nations of the Western world. Soon relations with France grew poor and severely damaged Jefferson's political system. Jefferson gave up his post at the end of 1793, again determined to quit public life. But in 1796 the Republicans made him their presidential candidate against John Adams. Losing by only a slim margin, Jefferson became vice president. Republicans doubled their efforts to elect the "man of the people" in the unusually bitter campaign of 1800. Jefferson topped Adams in the election and became president on March 4, 1801, in the new national capital, Washington, D.C. In his inaugural address, or speech after being sworn in as president, Jefferson brilliantly summed up the Republican ideas and appealed for harmony among all political parties. The president's greatest triumph came in foreign affairs. When Spain turned over Louisiana and the port of New Orleans to France in 1800, this action posed a serious threat to American security. Jefferson skillfully managed this crisis with the Louisiana Purchase (1803), in which America gained an uncharted region of some 800,000 square miles, doubling the nation's size, for $11.25 million. Even before the treaty was signed, Jefferson planned an expedition to explore this country. The legendary Lewis and Clark expedition (led by Meriwether Lewis [1774–1809] and William Clark [1770–1838]) explored the rugged land gained in the Louisiana Purchase, and the expedition became a spectacular product of Jefferson's vision of westward expansion. Easily reelected in 1804, Jefferson soon encountered troubles at home and overseas. His relations with Congress weakened as Republicans quarreled among themselves. Especially damaging was when former Republican leader John Randolph (1773–1833) and former vice president Aaron Burr (1756–1836) mounted a revolt in the west. But Jefferson crushed this and, with difficulty, maintained control of Congress. With tension between America and France reaching a boiling point, Jefferson avoided war by installing an embargo, or a suspension of trade, in December 1807. On the whole, the embargo was effectively enforced and reasonably successful, but the mounting costs at home led to its reversal by Congress near the end of Jefferson's presidency. In retirement Jefferson became the "Sage of Monticello." He maintained a large correspondence (wrote letters) and remained interested in a broad variety of intellectual pursuits. Unfinished business from the Revolution drew his attention, such as revision of the Virginia constitution and the gradual emancipation, or freedom, of slaves. Jefferson was the master planner of the University of Virginia in all its parts, from the grounds and buildings to the university rules, teachers, and subjects taught. He died at Monticello on the fiftieth anniversary of American independence, July 4, 1826. 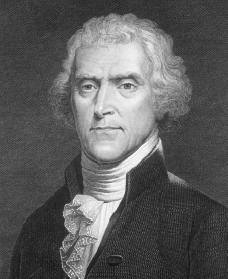 Jefferson remains a major figure in the development of the United States. His accomplishments, both large and small, and his beliefs, both political and personal, remain inspiring to Americans, especially through his masterpiece, the Declaration of Independence. Bober, Natalie. Thomas Jefferson: Man on a Mountain. New York: Atheneum, 1988. Reprint, New York: Aladdin Paperbacks, 1997. Bruns, Roger, ed. Thomas Jefferson. New York: Chelsea House, 1986. Ferris, Jeri. Thomas Jefferson: Father of Liberty. Minneapolis, MN: Carolrhoda Books, 1998. Malone, Dumas. Jefferson and His Time. 4 vols. Boston: Little, Brown, 1948–1970. Nardo, Don. Thomas Jefferson. San Diego: Lucent Books, 1993. Old, Wendie C. Thomas Jefferson. Springfield, NJ: Enslow, 1997. It says on this artichle that Jeffersons birthday is April 13 although when I watch a program on TV about him, it shows his gravestone date of birth April 2, How can you make a mistake like this? In 1752 the Julian calendar ('Old Style' - designated "O.S." as appropriate) was abandoned for the Gregorian ('New Style'). The result was an 11-day shift in the date (i.e., Sept. 2, 1752 was followed by Sept. 14 instead of the 3rd). So Jefferson was in fact born on the 2nd but, after 1752, celebrated his birthday on the 13th. Do any of you guys know what the names of Thomas Jefferson's children were. If you do then, can you provide me with a website that will provide me with any pictures or information about them. I need this information for a school and home project and research. I need this information for a Power Point slideshow presentation. Thomas Jefferson (April 13, 1743 – July 4, 1826) was an American statesman, one of the Founding Fathers of the United States and the principal author of the Declaration of Independence. He later served as the third President of the United States from 1801 to 1809. Previously, he was elected the second Vice President of the United States, serving under John Adams from 1797 to 1801. A proponent of democracy, republicanism, and individual rights motivating American colonists to break from Great Britain and form a new nation, he produced formative documents and decisions at both the state and national level. He was a land owner and farmer. Jefferson mastered many disciplines, which ranged from surveying and mathematics to horticulture and mechanics. He was a proven architect in the classical tradition. Jefferson's keen interest in religion and philosophy earned him the presidency of the American Philosophical Society. He shunned organized religion, but was influenced by both Christianity and deism. He was well versed in linguistics and spoke several languages. He founded the University of Virginia after retiring from public office. He was a prolific letter writer and corresponded with many prominent and important people throughout his adult life. His only full-length book is Notes on the State of Virginia (1785), considered among the most important American books published before 1800. Jefferson owned several plantations which were worked by hundreds of slaves. After the death of his wife Martha in 1782, he had a relationship with his slave Sally Hemings and fathered at least one of her children. Historians have lauded Jefferson's public life, noting his primary authorship of the Declaration of Independence during the Revolutionary War, his advocacy of religious freedom and tolerance in Virginia, and the Louisiana Purchase while he was president. Various modern scholars are more critical of Jefferson's private life, often pointing out the discrepancy between his ownership of slaves and his liberal political principles. Presidential scholars consistently rank Jefferson among the greatest presidents. Slave or not women have always held sway over mens hearts. Thomas Jefferson being a man was no different. He obviously loved Sally Hemmings or he would not have had her at Monticello for 38 years. There is no other woman in Jeffersons life after his return from Paris but her. She was the love of his life after his wife and remained so until his death. please write more about his young life and his parents.